So how long has it been? I think the last time we got together, we were talking about Carrie Fisher, right? 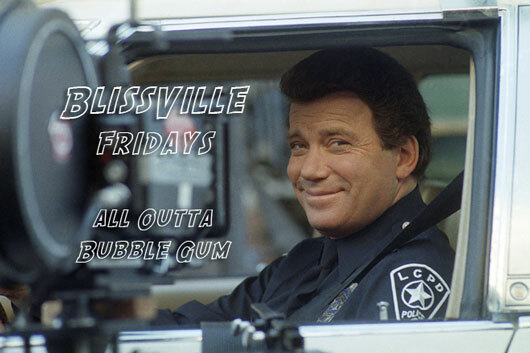 BlissVille is back with a new series of episodes sure to knock your socks off! Tonight, I talk to Geno Cuddy, host of Geno in the Evening, Comcast public access channel 15 in Connecticut. “They Live” is a 1988 American satirical science fiction horror film written and directed by John Carpenter. The film stars Roddy Piper, Keith David and Meg Foster. It follows a nameless drifter (called “John Nada” in the credits), who discovers the ruling class are in fact aliens concealing their appearance and manipulating people to spend money, breed, and accept the status quo with subliminal messages in mass media. The first time I saw the movie was on something called the Universal Debut Network; it was a syndicated movie package that Universal Pictures sold to independent networks, I saw it in 1990, it was on Channel 11 here in New York City. The Universal Debut Network was the pre-cursor to all the syndicated series Universal would show, but at first they started with movies like “They Live”, “Prince of Darkness”, “the infamous extended TV version of the movie, “Dune”, where David Lynch took his name off the credits. Apparently Lynch said, “wait a minute, this movie makes sense now, I’m taking my name off the picture!” So after this run of pictures, shows like Hercules and Xena came on the air because they were thinking about putting together a fifth network at the time. So how do we look on politics, censorship, liberalism, conservative ideology now as opposed to 1988? In Carpenter’s fantasy, these things are just gradual with no tipping point, no rhyme or reason, but I think certain things happened to bring us a “They Live” situation, like 9/11, obviously 9/11 destroyed our country but in a slow, gradual way, like death by a million cuts. To me, it’s allegory, like all great science fiction. “Invasion of the Body Snatchers” – in the 50s, it was allegory for the Cold War and Communism. In the 1978 version, it was about the “Me” Generation and pop-psychology. In the ’93 remake, it was allegory for disaffected youth and generation X. It was in a rotten part of town; the high-crime, low-rent section of South Philadelphia now known as Lower Moyamensing. The place has cleaned up considerably since (had to be about thirty years) but the old Colonial is no more; demolished in 1989. It looked like a palace in 1910 when it first opened. All glitter, all neon, art-deco lighting piping, beveled curves and thick red carpets, I could imagine the ticket-takers in red uniforms and little pill-box caps opening the double-doors for the next show. You’d probably get a newsreel, cartoon, two short-subjects, and a feature for a nickel. Even had a pipe organ in residence, just off to the side of the screen. The pictures were the only place you could escape to in those days. No television, no internet, no cable. Even radio would be interrupted with little snippets of reality from time to time. News of the wars, tragedies, epidemics hung on the limited airwaves. So they went to the movies – en masse, flocks of the curious watching projected stories and eating popcorn and Black Cow chocolate caramels. People still dressed up for the movies. Men in suits with ties, and ladies wearing laced walking gloves and snoods. All that changed by the time I walked through the double doors under the marquee. In big, red blinking lights, the word “COLONIAL” lit up dark Philly skies. South Philadelphia was very dark and flat at night and you could hear crickets. Strange that you could hear crickets in an area almost completely made up of row houses with very few trees. It was creepy but well worth the rather long walk from my house. It was cheap. Anybody could afford it. I’m dating myself a bit, but I remember the shows were a buck a ticket, and it could be any kind of show – double features, triple features. I saw “Ghostbusters”, “Fright Night” and “A Nightmare on Elm Street 2: Freddy’s Revenge” on a triple bill for one dollar. I saw “Jaws” and “Jaws 2” for one dollar. So it goes. This was not a multiplex with stadium seating. The seats sloped up to a point and then there was an enormous (off-limits around the time I was a customer) balcony that stretched to both sides. This could just be nostalgia since I was a young man, but everything looked big to me. I was amazed every single time I went through the double doors. Time was not kind to the Colonial. It had fallen into disrepair starting in the late sixties. The thick, red carpet had worn down. There were gashes in the walls. The incredible chandelier hanging from the ceiling teetered threateningly, and even in packed houses, people moved away from it when the Dolby soundtrack of “Raiders of the Lost Ark” (due to the Lucasfilm theater alignment program) thundered and vibrated all across the room. The chandelier would shake and we would gulp and say silent prayers that the crystalline beast would not collapse and devour us all. The homeless would sneak in after hours and help themselves to the Colonial’s comforts. There was the unmistakable odor of urine in the aisles. There was no maintenance or janitorial upkeep, so popcorn, candy, and sticky soda would litter the floors. 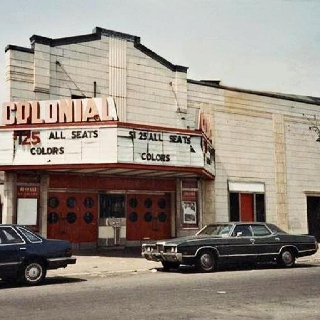 In those later years, the Colonial had a roach and rat problem, but people still came to see the very cheap shows. A triple feature I was not permitted to see consisted of “Porky’s”, “Fast Times at Ridgemont High”, and “The Last American Virgin”. 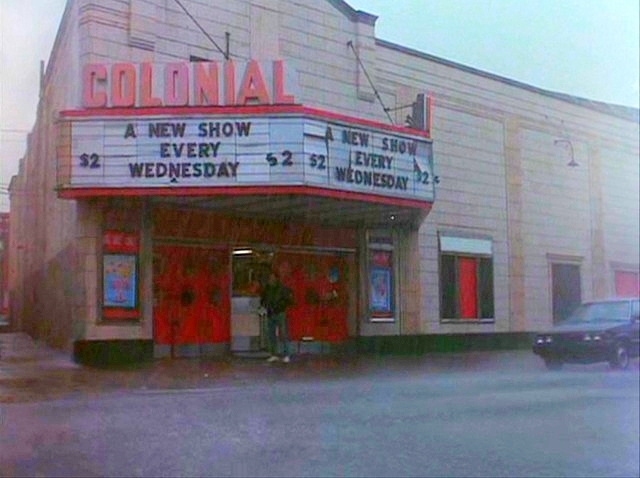 You might get the occasional trailer for a movie the Colonial was scheduled to show, but there were no commercials, no pleas from Roy Rogers for donations, and nobody telling you to turn off your cell phone and shut up. In recent years, movies have been turned out to be more of an event. 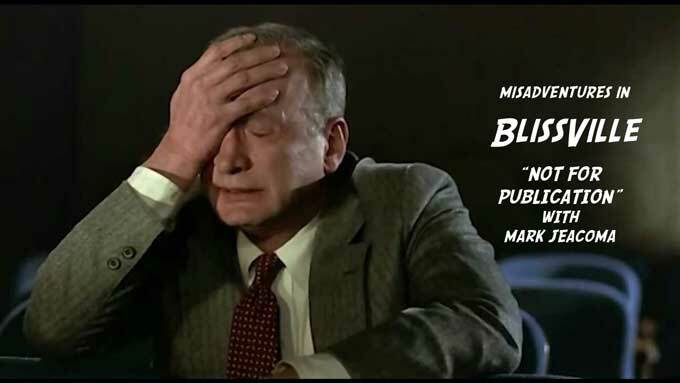 The rising ticket prices and 3D glasses, and the cattle-herding of audiences into and out of the theaters has transformed us into what we suspected we were all along – mindless consumers looking to kill two-plus hours in the dark. As early as the late 70s, Hollywood put all it’s money into the first weekend, and as the quality dropped, the prices for tickets went up dramatically, $15 to $20 (or more) a pop. Repertory houses were the last thing we had that was close to the roadshow/Roger Corman rollout from many years ago. Movies would roll out in selected territories, do their business and move on, and not all the advertising money was spent in the first week. Very few prints were made (none of this 4,000 screen business), and very rarely did any of those movies lose money. Sometimes I could hear the ghosts of old, shuffling in and out of the theater. You’d suspect there were well-dressed patrons, the sound of a big band down the street, sailors home on leave making their way into the Colonial to catch the latest James Cagney or Humphrey Bogart. 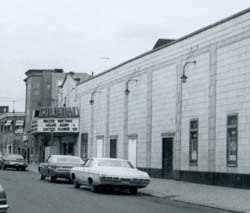 With that news that more than 100 theaters will close by the end of the year because they refuse to make expensive digital improvements to their screens, the Colonial’s demise seemed to be the first warning sign that simply taking in a movie was going to be a thing of the not-so-distant past. Originally published December 2, 2014. This is my interview with Alex Saltz, actor and mastering engineer, and one of the stars of my movie, “Total Male Fantasy No. 10”. This is probably the first time we’re talking about the movie at least publicly, but we should start with a little background. I met Alex through a mutual friend, Mark Jeacoma, who has been on my show – twice, we talked about found footage, and we talked about Star Wars. We recorded a couple of shows, one was the famous (or infamous) Scientology podcast for “On The Odd” where we had everybody: Mark, Alex, Chris Hasler, Sarah, and me – that was a fun experience, just getting all those heads together and it turned out great. Found footage is literally just that – footage found. You’re walking on the street. You stop at a corner. There’s a garbage can on the corner. You take a peak inside, like you would, and you see a stack of video-tapes or even discs, but they’re not labeled in the conventional sense. These aren’t copies of “Night Patrol” or “Jaws” released by video companies. These aren’t attractive-looking with glossy slipcovers and keep-cases. These are BASF, Maxell, Sony tapes. They look like blanks, until you see the sticker on the side; a handwritten label that reads, “DARCY’S CONFIRMATION AGE SEVEN, ST. JOSEPH’S CHURCH, ASTORIA DECEMBER 15 1996” or something similar. “POP-POP RENOVATES THE GARAGE, JULY 6, 1992” or something else, something mysterious. Originally aired March 31, 2015.